Last week I posted Forest Sounds https://oilpastelsbymary.com/2013/12/04/forest-sounds-study-oil-pastel/ as a study, after some thought on the composition, colors and values I went back to the scene and painted it again. 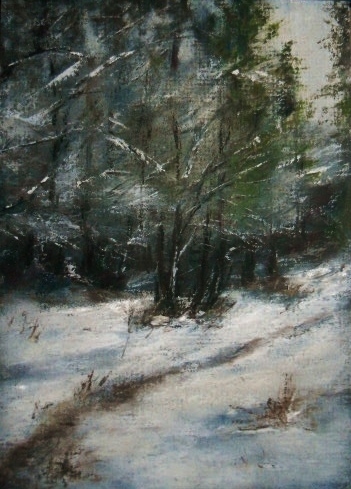 Today’s version shows a darker forest to illustrate one of those winter days that is cold and dark. Interesting, right? In Maine there are more overcast days, especially in the winter, than sunny days – it was very cold and lots of ice (at least by the coast)! For this oil pastel (7×5) I used Mi-Teintes black pastel paper which was perfect for creating the kind of atmosphere I was envisioning. Thank you to John Robinson, a wonderful photographer in the UK and member of pmp, for a wonderful reference image that became the inspiration for this painting. This entry was posted in About Oil Pastels, OPs New Paintings and tagged forest, Oil Pastel, painting, snow, winter. Bookmark the permalink. Fantastic Mary, it puts the viewer right into the scene. Love it! Thank you so much Elena – really reminds me of our backyard in Maine. This is really really nice Mary. I totally recognise your Winter’s ‘atmosphere’ here Mary .. Lovely depth in those colours . Thanks Poppy – glad you noticed the depth it was exactly what I was trying for! Your comments made me think of our time in Maine, we would hear our boots crunching across the snow as we trudged through the white stuff. Thanks very much – oh the joy of winter (we have lots of ice up in North TX)! Mary, love this forest green color you chose…stunning. Thanks Laurie, hope you and your family have a wonderful Christmas – I’m sure the little one is filled with just a bit of excitement! Thanks Marina – hope you have a wonderful weekend!